A recent addition to the Mazda lineup is the sleek and sporty 2019 Mazda3 which is offered as a sedan or a hatchback model so car shoppers can find a vehicle that meshes with their daily driving habits. Currently, Matt Castrucci Mazda is leasing the 2019 Mazda3 sedan to qualified buyers for only $209 per month on a 36-month 10,000-mile lease with $2,999 due at signing. The 2019 Mazda3 hatchback can be leased for $239 per month on a 36-month 10,000-mile lease also with $2,999 due at signing. Both the 2019 Mazda3 sedan and hatchback get equipped with the powerful and efficient SKYACTIV® drivetrain that provides them with plenty of horsepower while also averaging excellent EPA estimated fuel economy ratings. There is also a split-folding rear seat inside the 2019 Mazda3 sedan and hatchback which provides owners with convenient cargo and passenger versatility and the easy-loading hatchback rear door adds even more convenience. 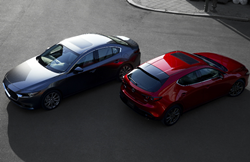 Interested customers can browse Matt Castrucci Mazda’s available 2019 Mazda3 inventory as well as setup a test drive by navigating to its website, http://www.mattcastruccimazda.com. Once there you can also find more information regarding the 2019 Mazda3 by accessing its blog. All other questions can be answered by calling 855-299-1814 or by talking with a friendly Castrucci staff member at the dealership located at 3013 Mall Park Drive.